After two long weeks of repairs and upgrades, I'm happy to report that the Enterprise has returned home to its standard orbit around Starbase One / Earth (that's back on the mooring a few hundred yards from the yacht club.) Thanks to Ensign Ceaser and my wife for their help in bringing the ship back home, re-rigging and straightening up so that she'll be ready for the weekend and next week's return to racing. Even though it took longer than expected, Consolidated Yacht Yards did a great job on the new sealed-up keel and the installation (finally) of the new Tacktick wind instrument and Raymarine Wireless Mast Rotation Sensor, which will act solely as a repeater for the wind instrument's wireless signal. The first thing I did when I got on board was hit the power switch, and, to quote the words of Chef Emeril Lagasse... BAM! That's right. 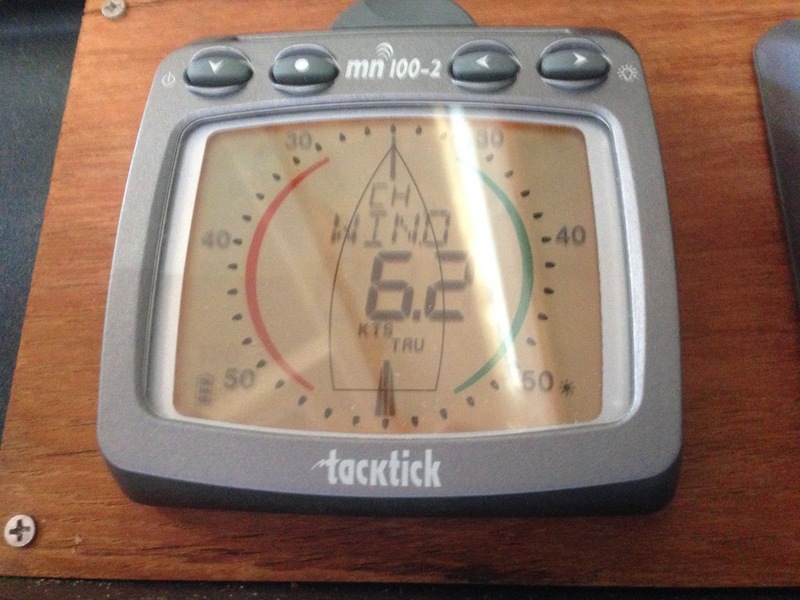 For the first time since I bought this thing two years ago, I was getting wind readings outside of the box (not that the wind is usually that much stronger in Western Long Island Sound anyway). We picked up the mooring at 5:45 with enough slime and growth on it to satisfy the "seek out new life forms" part of our mission for the next several years. The genoa was back on the forestay, hoisted and furled by 6:20 -- we could have made racing. That is, if Dave and Dave Jr. weren't taking the night off and Kurt wasn't stuck in bed with a flu-induced fever. Better we skipped it. And that decision felt better and better as we watched the fleet go slower and slower, seeing the wind drop to 2.1. 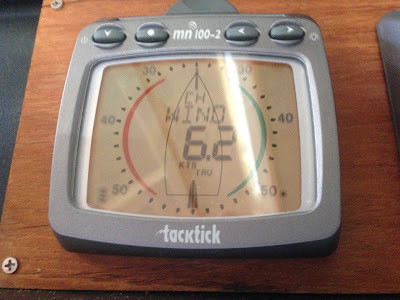 And yes, that reading came from our working wind instrument! This weekend, I'll work on some more of my engine-control upgrades and, perhaps, get a voyage in. Though, to be perfectly honest, I have just as much fun staying put and tinkering as taking a trip around the Sound. As the Enterprise continues to be repaired, I found myself trying to think of ways to get out on the water this past weekend - sans starship, so to speak. One option was to call one of the five or so captains I knew planning to participate in the City Island Cup for two days of working on someone else's boat in close to zero breeze "racing" in a poorly-marketed, half-baked regatta (they only got 2 out of the 5 races in) or try something completely different: Party Boat Fishing. So, on Saturday night, while waiting for our entree at Applebee's (I can wine and dine with the best of 'em), I purchased two tickets on my iPhone 5 for the "Island Current" -- 8 hours of Long Island Sound porgy fishing departing from City Island. The 8 hours did include almost 4.5 hours of motoring to Northport and back, but being out on the water is always a magical time for me. Initially, I had some concerns about being on a Bronx-based boat, but the crew of the Island Current are very friendly, know their stuff and did a fantastic job getting us set up, finding a perfect fishing spot, and giving some much-needed expert advice on the best way to catch. After a few tries, I caught my first porgy - a little over 12 inches. And then, as luck would have it, I caught a striped bass. That's right, Porgy and Bass. You knew I had to get that in there. I had to throw the bass back, because they said it wasn't in season. I guess the bass didn't get that memo. 1. If you laid them out, end to end, it would be longer than my father's boat. 2. 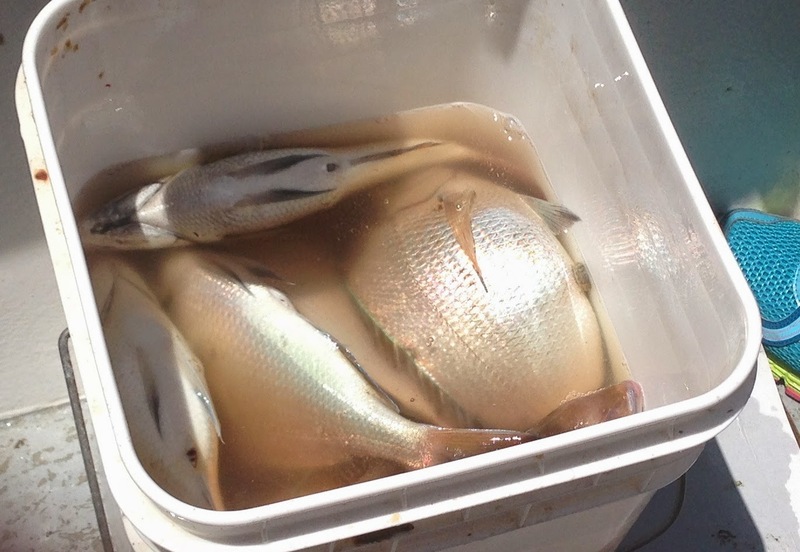 I'm looking at all sorts of fish dinners in my near future -- Fried porgy. Barbecued porgy. Porgy scampi. Porgy with mixed vegetables. Ummm, er, porgy parmigiana? Finally, as we were powering back with our freshly filleted catch of the day looking out over Rye, Mamaroneck, Larchmont, New Rochelle and Hart Island, I started to think about the smaller porgies we threw back (10" minimum) and the striped bass, coming to the conclusion that, maybe, we should start believing people when they say they were abducted by aliens. After all, this bass will go back to his family and say he was just hanging around, minding his own business, getting something to eat, and then, all of a sudden, there was this great force pulling him upwards towards a great light and giant beings who evaluated him and then let him return home. Of course, the other bass will think he's crazy. Well it looks like it was a good move for EBYRA (and, seriously, how often does EBYRA make good moves?) to not run a race this evening due to the free Jennifer Lopez concert at Orchard Beach, right next to City Island. J-Load is expecting 25-30,000 fans and I'm told roads are already closed leading from the Hutch and Shore Road. What a mess. Anyway, it's not like we'd be racing anyway. The Enterprise was hauled yesterday afternoon at Consolidated Yacht Yards after the expert divers at Barnacle Busters (who I will always recommend) were unable to access the centerboard attachment in order to remove the other half of the frayed cable and connect a new one. So, Consolidated has picked up the boat, pushed the board back in, and is now bolting it in place forever followed by sealing the slot to create, as far as I know, the world's first and only C&C 37+ shoal-draft-keeled sailboat. I've also asked them, since they have the boat, manpower and tools, to see if they can -- finally -- mount the Tacktick wind instrument and repeater onto the mast. Hopefully they can, and, with some luck, we'll have the Enterprise back soon. I must say it will be a welcome relief to have to never worry about the costs and maintenance of having a centerboard, especially knowing the amount of damage it could do and the lengths one has to go to just to do a scheduled replacement cable. A maintenance-free keel again. Not a bad birthday present to myself. Throw in a cupcake with a candle in it, along with, possibly, an hour or two in my new foredeck hammock-chair with my wife and my Bose bluetooth speaker cranking out some Bob Seger and the Silver Bullet Band from my iPhone 5, and I'm good to go. Racing for us will start up again on June 18.